World Backup Day – Hardware failure … . You are here: Home / Network and Application Security / World Backup Day – Hardware failure … . It's an unfortunate reality that companies and individuals are still losing data to hardware failures. Even companies that have regular backups can lose data if the right hardware fails at the right time. Let's run through why hardware failures are still a problem and what you can do to protect yourself. Let's face it; one of the reasons we lose so much data to hardware failure is that we collect and store so much data. There are a number of long-term trends that play into this, such as increased connectivity, lower storage costs, and the emergence of business intelligence and the technology that help companies collect and use data. Regulations and other issues require some industries and government bodies to generate, store and transmit data in ways that generate more data. Businesses and governments have so much data that document management services was a $5 billion industry as of November 2015. It isn't just companies that build up a lot of data; individuals are creating videos, taking pictures, and generating more documents and digital information than ever before. Multiple copies are generated as these files are shared across distribution lists, FTP servers, and social media applications. Simply put, there is a lot of writing and over-writing of data on inexpensive and mass-produced hardware. The aforementioned inexpensive and mass-produced hardware is usually quite reliable. One company that performs regular disk drive tests found that the cumulative failure rate for multiple hard drive types of various sizes was 3.36% in 2016. However, recent surveys indicate varying numbers of business data loss due to hardware failures. One survey found that hardware failure caused 21% of failure while another found that the same failures caused over 66% of lost data. Regardless of methodology and respondent demographics, hardware failures are still an issue across the board. We can all agree that the probability of hardware failure is not important when it's our own hardware that has failed. 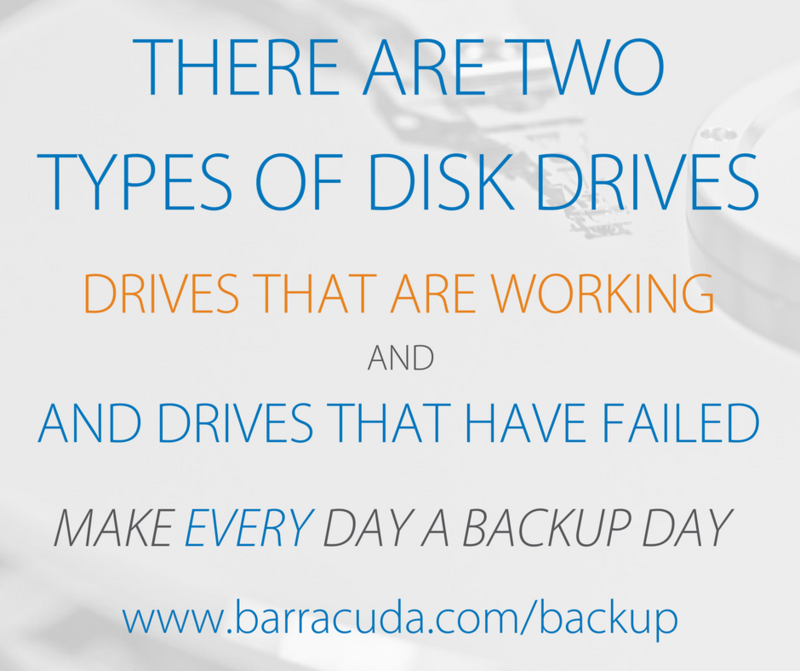 Keep your 2 backups in 2 different storage systems, such as an appliance and a tape, multiple USB drives, etc. The important thing here is to create redundancies so that you do not have a single point of failure in your data protection. Remember the old military maxim: two is one, one is none. The decreasing cost of cloud storage and reliable connectivity can make the cloud more attractive to companies with lower budgets. It's also easily scalable so the storage space can grow at the same pace as business needs. Many companies like to store their data backups in a cloud application such as OneDrive or a solution like Barracuda Cloud Storage. This is a great solution, but remember the redundancy rule mentioned above. Keep another copy on-premises or in another cloud, so that you have them in two separate places. The growing use of SaaS applications has also brought an increase in the amount of data being generated in the cloud. That data still needs to be backed up as part of your data protection strategy. Cloud data loss is usually due to human error rather than hardware failure, but it does happen regularly. Try a Cloud-to-Cloud backup like the Barracuda solution here, for a fast, efficient, reliable backup. WBD is recognized every year on March 31. While every day should be ‘backup day,' WBD is a great reminder to evaluate your data protection strategy and adjust it as needed.